I think the title of this post summarises the life of most tabla players, and Indian classical musicians in general! This art is so demanding, it seems no amount of practice is ever enough. One gradually gets better over time, but perfection – if there is such a thing – is elusive. One hears this from highly advanced players as much as from beginners. I used to find it hard to believe. But now I’m starting to understand. There is no “end point”. Only the journey. This is kind of scary to contemplate, and yet exciting at the same time. Abhijit Banerjee is currently guiding me through it – he has recommended practicing the phrase “Dhina Dhara Gena” as this is where the difficulty lies. Especially in the “Dhi-NA”. Sounds do-able… it isn’t. All my attempts thus far have felt like a case of one step forward, two steps backward. There are days when it feels like it is starting to come. But then the next day, I can hardly play it at all. Confounding. I am left wondering how on earth it can be so difficult, and how the masters manage to play it so well. Although, Abhijit Banerjee has admitted to me that he hardly ever plays this rela as it is “too much work”! I’m relatively happy with my progress in other areas. I’ve been trying to focus on solidifying my core material, by practicing in a slower tempo, with only occasional bursts of speed. As opposed to trying to play fast all the time. It is really important to build up an “internal rhythm” which is best done by practicing in slower tempos (it seems), otherwise it is very easy to get off track when you play fast. This feels like a process of “gradual refinement”, which takes patience and time. Like steadily chipping away at a rock to create a sculpture. That’s a good analogy actually. At first you’ll only see the bare outlines of the sculpture. Over time, bit by bit, you’ll refine it until a life-like statue appears. But that takes time, lots of time, and you can’t rush it. 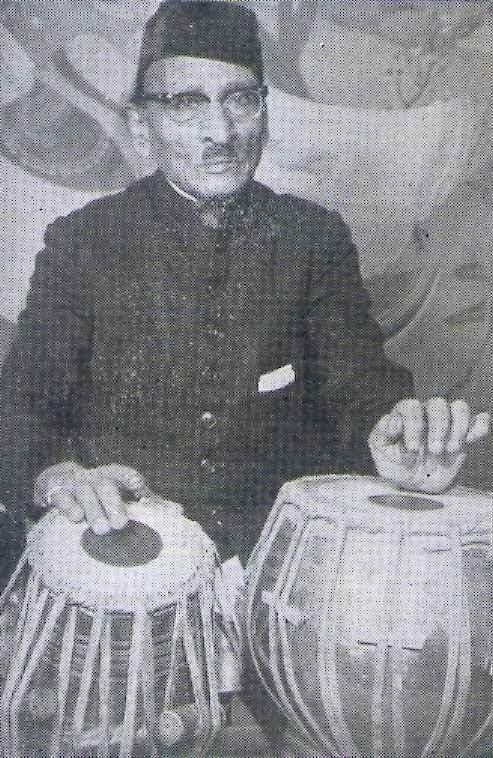 This is a picture of Ustad Ahmed Jaan Thirakwa, a legendary tabla player of the 20th century – widely considered the best tabla player of his time. I felt inspired to post this photo here as he is one of my all-time favourite tabla players and a towering figure in the world of tabla. I have sometimes wondered what it is about his playing that is so attractive. Many tabla players have excellent technique, excellent knowledge of compositions, speed, clarity, dexterity… when I listen to Thirakwa Khan-sahib’s playing though I get the feeling that he has transcended technique and is simply one with his instrument. His playing seems effortless, as if he is not really trying. There is a mesmerising quality about his solo playing, which is a quality I have heard in almost no other tabla player, with the notable exception of Ustad Latif Ahmed Khan of Delhi, who passed away in the late 1980s and left us with very few recordings. Keen to hear your thoughts and comments – please leave your thoughts in the comments field below, alternatively feel free to send me an email (shivabreathes at gmail dot com). I wanted to post a YouTube video of a UK-based Pakistani Tabla player called Shabaz Husain giving a TEDx talk about Tabla and Pakhawaj at the University of Manchester. I find this video interesting because Shabaz Husain describes the historic evolution of the Tabla from the Pakhawaj amidst the parallel evolution of Khayal vocal singing from Dhrupad. An evolution I have also described in my earlier post on Tabla Gharanas. I was fortunate to have a lesson today with the great Abhijit Banerjee. We are restarting lessons after several weeks break due in part to his being in LA for a few months and also due to an ongoing hand injury I had been contending with. The Paran was not too difficult at first glance, but took me quite a while to commit to memory, the second and third line in particular had some intricate bol patterns that took a lot of repetition to get right. So, we went through that Paran and guruji was satisfied that I had learned it correctly. Following that, he took the lesson in an unusual direction: Laggis. Laggis are short phrases normally associated with light music or bhajans. Repetitive and somewhat “funky” sounding. I would compare them to a “riff” in a rock guitar context, a small musical phrase repeated over and over again for rhythmic effect. Panditji asked if I knew any Laggis – I don’t know many. He said we should go through a few as they are useful phrases that one should have in one’s repertoire. They are also good practice phrases. So we did to through a few, in Keherwa (8 beat) taal. I have enjoyed playing them. I have found that good tabla players do use Laggis to good effect even in a classical context, they can often be interjected to liven things up a bit, and they are also useful to know if one ever needs to play something in a light music context.